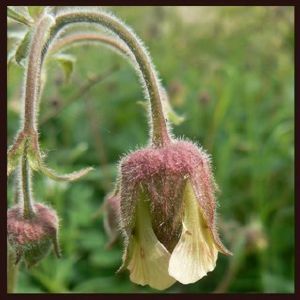 Geum rivale 'Album' is a compact herbaceous perennial. 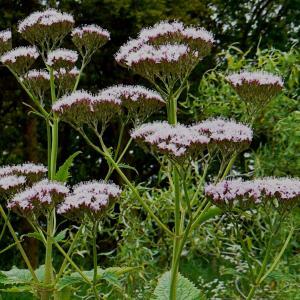 In late spring, it bears dainty, nodding, white flowers on wiry stems held above its lobed basal foliage. 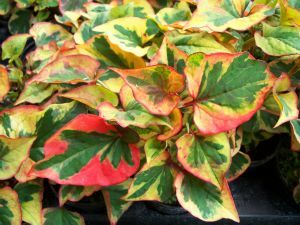 Houttuynia cordata ‘Pied Piper' is a herbaceous perennial plant, growing to between 20 and 80cm. Flowers, growing usually in summer, are greenish-white, borne on a terminal spike 2–3cm long with 4-6 large white basal bracts. 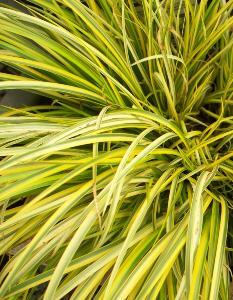 The plant grows well in moist to wet soil and even slightly submerged in water in partial or full sun. Some varieties can become invasive in the right conditions, but fortunately ‘Pied Piper' is a little more tame. It has very vivid colouring throughout the growing season, and is constantly changing hue, deepening and becoming more vivid as the season ages. Where space and soil permit, it will in time colonise a good area. Where space is limited, it makes a superb subject for a container without accompaniment.